Black Lives Matter is the motto for a movement created by American citizens in response to recent, highly publicized incidents of racial violence and injustice throughout our country. The motto symbolizes the concern for racial justice and equality. 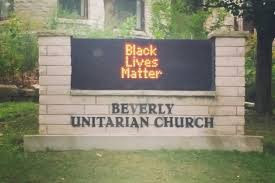 Several Chicago area Unitarian Universalist congregations display Black Lives Matter signage, including the Unitarian Church of Evanston, the Third Unitarian Church of Chicago and the Beverly Unitarian Church. The Beverly church has a large electronic sign in front of its castle-like building. It is highly visible. I applaud Beverly Unitarian for having the courage to engage in public witness in a community that struggles with racial integration. The community is bordered by two poor black neighborhoods, one middle class black neighborhood and two middle-to-upper middle class white neighborhoods. Even more challenging, Beverly is home to a huge number of Chicago police officers and firefighters, many of whom are part of the congregation. The vitriolic comments that poured onto the church accused the congregation of being anti-police and stoking violence against police. This was so upsetting that the board felt the need to clarify their position. I was approached by a fellow Unitarian Universalist to sign on to an open letter designed to publicly shame our fellow Beverly congregation into restoring Black Lives Matter to their sign. I refused to sign this letter and I sent my refusal to local colleagues and others who received the request. This is a learning moment for Unitarian Universalists, other progressive congregations, and all of us who want to participate in the work of correcting the sins of racism. There’s no question that generating controversy is good and natural in the work of culture change and justice making. When a congregation stands together for a value held sacred, it deepens the community’s capacity to embody a specific value and integrate it into the wider society. But how do we respond to controversy? More importantly, how do we use it to generate understanding, compassion…. and change? This is delicate and challenging proposition. The issue at hand isn't simply the sign, it is so much more--the institutional racism that pervades our culture and how human beings are profoundly diminished and destroyed by this racism. That's what we need to address. And we need to look at how we are engaging our justice work--are we clinging to our opinions, rabidly promoting them and demonizing those who choose a different way? We Unitarian Universalists tend to be opinionated people with a very high opinion of our opinions! We can forget that strength comes in deepening in relationship with others--and this includes our capacity to listen to others, to hear multiple perspectives, and--here's what's most challenging--to love even those with whom we strongly disagree. My guide is Rev. Dr. Martin Luther King, Jr. and his understanding of radical love. Radical love doesn’t call us to be perfect. Radical love calls us to be rigorously honest with ourselves, willing to be critical of ourselves, and to discern the life-affirming basis on which we can stand collectively as witness to the world. Radical love calls us to be active and resist behavior and systems that are unjust.